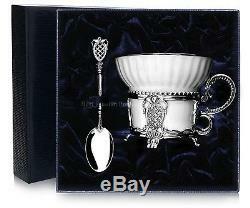 Set: Sterling Silver 925 Cup and Spoon "Maecenas". The item is HAND PAINTED and has a stamp of the factory on the bottom. Dear customers, visit our store, please. There are a lot of as beautiful things as this one there. Here is our store - Best Russian Porcelain. For more news, subscribe to our store. Bone porcelain, Sterling Silver 925. Imperial porcelain plant / Argenta. 57003806 / 21.00029.70. This set can be ordered without spoon and packing, for this purpose write to us. The set includes: a Cup of tea "Patron" with blackening, art. 56203006, tea spoon "Patron", art. A coaster and spoon is made on the original sketch from precious silver metal and "white gold" - high quality bone China, created according to a special recipe, developed by scientists in the 18th century Vinogradov. Silver body decorated in the technique through the thread on metal. 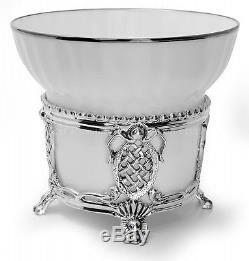 Silver is a metal that possesses natural healing properties. In ancient times it was prized far above gold. The metal body of this holder are decorated with beautiful, three-dimensional images. Spoon of silver, which will enrich any drink miraculous ions. All of the items set Packed in a stylish gift box in dark blue and ready for gifting. Exclusive work of Russian artists for metal and porcelain. The history of Imperial porcelain factory is inseparably linked with history of Russia, and its production the Russian art porcelain is presented in collections of the largest museums of the world. The imperial porcelain factory founded in 1744 in St. Petersburg under the decree of the daughter of Peter the Great empress Elizabeth became the first porcelain enterprise in Russia and the third in Europe. It is here where the talented Russian scientist D. Vinogradov (17201758) discovered a secret of production of "white gold". Products of Imperial porcelain factory which are created by artists of top-class, strike with the beauty and refinement of judges from around the world here already nearly three hundred years, being an embodiment of beauty, elegance and a delicate taste. Imperial porcelain is a symbol of refinement and luxury of your house, reflection of your unique style. It decorates interiors of houses of persons, whose taste doesn't raise doubts. Among them the former first lady of the USA Laura Bush, the former first lady of Brazil Marisa Letisija Lula da Silva, the queen of Malaysia Tengku Fauziya Abdoul Rasheed, the first lady of Mexico Marta Sakhagun. Director Valery Fokin, well-known performers Elena Obraztsova, Mireille Mathieu and many other famous people. Some details of decor are hand-painted so they can differ in colors as they are done by different masters. We are ready to answer all your questions. Thank you for your interest! This item includes: Cup 5,24 fl. About, The Imperial(Lomonosov) Porcelain Factory. The history of one of the oldest European porcelain ware manufacturers dates back to the 18th century, when according to the edict of the daughter of Peter the Great Empress Elizabeth the Imperial Porcelain Factory was established. Thanks to the talented Russian chemist, the inventor of Russian hard-paste porcelain Dmitry Ivanovich Vinogradov the secret of white gold production was unlocked. For the first time in history of ceramics Vinogradov presented the scientific description of porcelain production thereby enabling manufacturing of high quality porcelain ware out of domestic raw materials. What especially makes The Imperial Porcelain Factory that famous is the production of magnificent table sets that started during the reign of Catherin the Great. Catherin porcelain was recognized as a piece of art together with canvases and sculptures of prominent masters. Among the most well-known table-sets ensembles are Gurev, Armorial table sets, and collectors plates from the Gothic stained glass table set. Later on the IPF started producing porcelain dolls small figures of animals and people that were used for table decoration. The main task, which was given to the Imperial Porcelain Factory, was to provide whole Russia with porcelain- which still remains to be its motto. Till present day the IPF produces magnificent porcelain ware according to the sketches of most famous vases and table plates that belonged to the royal family. In our shop you can find the unique plates manufactured by The Imperial Porcelain Factory based on the original table sets, kept in the State Hermitage Museum and former residences of the members of the royal family. Incomparable hand dropped vases in Russian Empire style such as White night on Moika River, Michael Castle; marvelous vases made in technique of glazed landscape painting such as Russian side, Hermitage are made in a skillful way by the masters of the IPF and represented in our shop. You can find a great variety of porcelain statues made in the technique of hand dropping with manual overglaze painting such as The Firebird, Lady with a parrot, Fortuneteller and countless numbers of other masterpieces. Touch the sumptuousness, in the best traditions of the Royal Court. , « », « »; , « », «». The item "Russian Imperial Lomonosov Porcelain Set Sterling Silver Tea Cup Spoon Maecenas" is in sale since Saturday, February 20, 2016. This item is in the category "Pottery & Glass\Pottery & China\China & Dinnerware\Lomonosov". 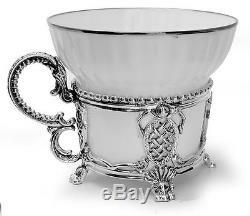 The seller is "best_russian_porcelain" and is located in St.